The Virgin Galactic founder wrote in a recent blog post that his company might try to break Baumgartner’s record by having someone jump out of the SpaceShipTwo vehicle, which will fly suborbital missions up to 361,000ft (110 kilometers/68.4 miles). “The technology of space travel and exploration is moving forwards every day. Who knows, the next record leap could one day be from Virgin Galactic’s SpaceShipTwo. Haven’t had a challenge myself for a while. Could be fun for Virgin to give Red Bull a run for their money,” Branson wrote. “Completely insane,” Bamgartner told The Daily Telegraph, accusing the British billionaire of a lame attempt to gain cheap publicity from his achievement. The Austrian skydiver also opined about what he sees as humanity’s misplaced interest in exploring the Red Planet. Chances are Baumgartner is not going to be invited to any NewSpace conferences or NASA centers any time soon. Oops, that’s a PR bungle. I don’t know, sitting in that chair for a few hours seem like pretty hard work… Not. I fail to see what is hard about the whole thing. No body knew who Joseph Kittinger is, and no one will know Felix Baumgartner by the year’s end. Just a guy milking the last drop of his 15 minutes of fame. If I were Branson, I would probably not even bother with the jump. Just put a chimp in a pressure suit, and push him out at that altitude that Felix had jump, and let the media circus take care of Felix. I haven’t been this disappointed in an Austrian since that blonde lady betrayed Indiana Jones in the Last Crusade. This asshat dares to call exploration a waste of money when his only contribution to the world was NOT making a crater. I’m starting to think his braveness is due to stupidity rather than anything else. I knew something wasn’t right with this guy the minute he started comparing his jump to the moon landing. Stop giving him a hard time just because his views do not necessarily align with yours. Regarding Mars Exploration: this is not something that everybody agrees upon. For a lot of people this is still something from the realm of science fiction. Almost everybody knows, to some degree, that the Apollo program was enormously expensive and that it was cancelled primarily because of this reason. So every mildly intelligent person can do the math and realize that trips to Mars would be even more expensive. This is where the this “waste of money” thinking comes from. On the other hand, the general public is not yet aware of the uprising of the “new space” industry and the arrival of the era of commercial spaceflight. Ask anybody outside the space enthusiast community about new space and commercial spaceflight and all you will get is baffled looks (maybe this is a bit different in the US, but I guess even there a lot of people do not know anything about SpaceX…). Baumgartner is a Skydiver and Basejumper. He has no background in space technologies, science, etc. as far as I know. How would he know about all the different developments that are under way? On top of that, for the past few years he has been working with a group of what I would consider primarily “old (aero)space” guys. That certainly had some influence on his views. Apart from that, all his quotes in the interview seem to be related to manned missions to Mars, but the articles makes it look like he is opposed to all exploration of Mars (and possibly space altogether). I’m not sure if that really is what he wanted to say. Regarding Branson and Newspace: I think his comments are less targeted at reaching space on suborbital flights (that is actually a lot easier than a balloon flight once you have the “ship” and propulsion dialed) than at the idea of “simply doing a ‘spacedive’ from that altitude to casually beat Baumgartners current record”. That is simply nonsense! I can’t imagine jumping from more than twice the height of Baumgartner without at least some sort of reaction control system to stabilize the first phase of flight. So I have to agree with Baumgartner, that Branson made that comment just to get another injection of publicity for his own projects that are years behind schedule! Disclaimer: I’m Austrian, so maybe my views are biased, but I think that his views actually aren’t that stupid at all. I met with Burt Rutan at Mojave in 2006 (with Chris Gilman) and discussed the SpaceDiver concept, as he hadn’t heard of the idea. he told us that if he wasn’t so busy with “that” (he was working on the SpaceShip 1) he would want to do it with us right then.I also spoke at an ISDC to Virgin Galactic’s Will WhiteHorn in 2005 about the idea that Virgin should consider dedicated SpaceDiver flights as a revenue stream with a specially designed vehicle I called SpaceShip III. (which would be painted black of course). Baumgartner is not a space guy. He is a stuntsman and nephew of a guy with a sportsdrink company who has no Vision nor concept of what is possible. I do certainly hope that if Virgin/Branson moves in that direction they do reach out to our team (Hint George W.) as we have put a lot of thought into this project over time – although we have had some setbacks and it has been on hold a bit recently. I meant to ay Rutan was working on SpaceShip II in my note. Pretty unfortunate… I guess my #1 “badass” is still Joe Kittinger, then. Talk about building a house (record achievement) then burning it down (blasting space exploration). I mean, I get where he’s coming from, but he’s not getting where Mars exploration… space exploration… is coming from. He also doesn’t realize that in Joe’s time, had we said someone would try to break Joe’s records from a pressurized capsule at 129K ft. someone would’ve called the idea “completely insane” as well. Jumping from 128,000 feet was bad enough. Baumgartner broke the sound barrier in a flat spin. He very nearly didn’t get into the proper attitude for his chute deployment. At 400,000 feet, there will be no atmosphere to stabilize a person. That’s just the beginning of problems. Remember the velocity equation in a vacuum? v(t)=v0+1/2gt^2, where g=32ft/s^2 or 9.81m/s^2. It took Baumgartner less than 40 seconds to exceed Mach 1. Now triple that (400/128=3.125). In 120 seconds, our Virgin Galactic skydiver will be traveling at over 2,400 mph, or over Mach 4, by the time she hits the atmosphere, faster than an SR-71. Remember that aircraft? It was made out of titanium and turned red-hot at 60-80K feet at Mach 3.6. And recalling dynamics, she’ll be tumbling. As our intrepid skydiver descends into thicker atmosphere and increased drag, her suit will melt away, she will be cooked literally to carbon, and then she’ll be ripped-apart, her body part raining down to Earth. She. Will. Die. Baumgartner trashed NASA and new Space, angering both sides. He spoke things a lot of people don’t want to hear. But, as one can see, he was T least partly right; Branson was full of it. Sorry, I only integrated part of the equation. The actual equation is v(t)=v0+gt. I accounted for drag by rounding down the numbers from the actual values as a function of t. That is why these numbers do not match up if I were punching in the actual values for time. If anything, speeds would be quite a bit higher. Bottom line, is that jumping from 400,000 feet is with today’s technology not readily possible for humans. Therefore, Branson was wrong and Baumgartner was right. I’m actually surprised nobody caught this using the basic equations of physics. As I see it, Baumgarter is the only person other than Kittinger to survive a jump above 100,000 feet. I imagine a great deal of preparation and thought went into planning the jump and making sure he came out of it alive. 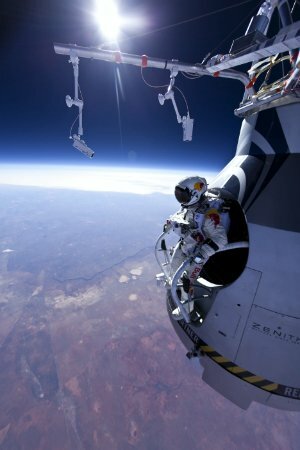 So, when Baumgartner says that jumping from 400,000 feet would be crazy, I tend to give him the benefit of the doubt. It is something he knows about. This is not what the NewSpace folks want to hear, but it serves as a good caution. As for Baumgartner’s views about Mars exploration….whatever. It’s just one guy’s opinion on a subject in which he is not an expert. Some people think we should have sent humans to Mars by 1980. Others believe there are better ways to spend that sort of money. I see the merits in both arguments. A spacediver in freefall from 62+ miles wouldn’t be much different than a suborbital space vehicle in freefall from the same altitude. In other words, not so much “impossible” as an engineering challenge to solve. Yes, it will require stabilization as do the vehicles, but there are several known ways to handle this. Baumgartner is not an engineer and neither is Branson. Both are off the mark. Many of Baumgartner’s challenges were related to getting to altitude; future space divers will have that taken care of by the suborbitals. On the other hand, survival for the length of time needed to return to atmosphere, and issues related to atmospheric heating (though not nearly as bad as the SR-71 example) are issues that will need to be overcome. Most who actually are experts in the science agree that this is an achievable capability.